It's not protecting humans from machines. Google may be an "AI first" company, but few people who work there actually use the term artificial intelligence. That's because it doesn't actually describe the seismic shift currently happening across all of the Alphabet Inc. (GOOGL - Get Report) unit's products. The better word for that process is machine learning, which is the technology that's making our computers think and act more like humans, said Peter Norvig, an AI scientist and a director of research at Google. "Sundar has come out and said we're an AI first company, and that's a pretty bold statement," Norvig told The Street. "Internally we use machine learning more...it's what we're going to use to become an AI-first company." Google CEO Sundar Pichai has been charting a transformation at the company ever since he took over as chief executive in 2015. Google's next big step is to navigate a future where mobile devices fade away and are replaced by omnipresent intelligence assistants -- an "AI first world," as Pichai has said. But before that future can become a reality, Silicon Valley giants will have to overcome the obstacle of helping average people understand just what exactly AI is, as well as how it can be used in their everyday lives. The invention of products such as Google Assistant, Amazon.com Inc.'s (AMZN - Get Report) Alexa and Apple Inc.'s (AAPL - Get Report) Siri has demystified a lot of the confusion surrounding AI, Norvig said. It's helped people realize that AI isn't going to materialize as Skynet from "The Terminator" or as the so-called singularity -- the theory that one day machines will become smarter than humans. 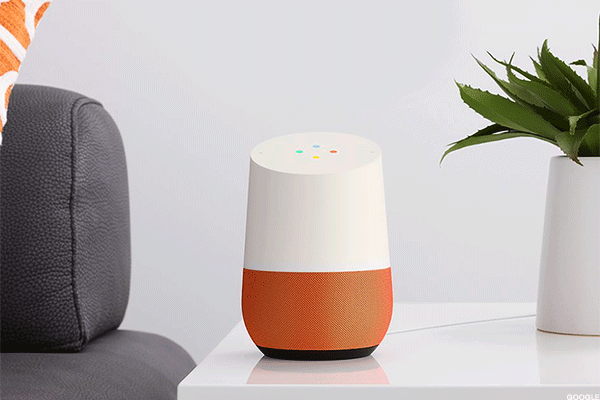 The Google Home houses the tech giant's AI-powered Google Assistant. "What you're seeing now is people reacting to the technology," Norvig said. "A couple years ago, I didn't want to talk to my phone. It made too many errors, so it wasn't worth it, but now it's worth it because it gets it right most of the time." "So I think people are very willing to adapt to technology that works, and not willing to adapt to technology that doesn't work," he added. In just three years, the artificial intelligence market is estimated to be worth as much as $70 billion, according to consultancy firm PwC. The flurry of digital assistant products has largely been the tipping point in AI's rapid ascension, with 35.6 million Americans expected to use a voice-activated assistant device at least once a month this year, eMarketer noted. Statistics like these only tell the beginning of the story that AI is improving and expanding at a faster rate than many realize. That said, some view AI's rise as a looming threat that will result in the elimination of many low-paying jobs, leaving people to redefine the structure of our economic models. User interfaces are going through a monumental shift from clicking on an icon to having a conversation with an assistant, Norvig said, which has created a domino effect on everything from how we write apps to how businesses interact with each other. In short, people are getting more comfortable with talking to machines in a human-like manner. But that doesn't mean everyone is used to these kinds of interactions just yet. "We have to give the user a better model of what it is that they can say and do," Norvig said. "Now you just have a blank speaker to which you can say anything...so [we need to] establish that common language of here's the boundaries of what you can say and here's how far you can go." Google is also making the process of interacting with AI more seamless. One big way it's doing that is through Google Lens, which is coming soon to Google Photos and Google Assistant. Lens uses machine learning technology to analyze a person's surroundings and provide suggestions, just by using the camera on a smartphone. During a demo at Google's I/O conference in May, the company showed how users can point their camera at a restaurant and then based on GPS data, view information on the phone's screen showing reviews, hours of operation and other useful details. Just as people are coming face to face with AI in voice and photo, Silicon Valley is already thinking about what's next for the life-altering technology. Norvig reiterated that he can't predict the future, but if he had to place a bet, it would be on video. This might mean that AI systems become smart enough to be able to process hours of video in a second to understand and recognize patterns. "We might have whole new types of interfaces," Norvig added. "It might be on the phone ... but it could be other things like thermostats that figure out what room you're in and whether they need to keep heating that room or not." Google's shares rose 0.1% to $930.84 on Monday morning.